As badly as we want to pull all of our troops home from Afghanistan, a rush to pull up stakes leaving nothing but chaos and instability in our wake would be a mistake, and would seriously call into question America’s leadership role around the world. We’ve all heard the stories. We’ve all heard about the toll this incessant “war” in Afghanistan is taking on our troops. We’ve heard about how our soldiers are cracking after four or five or six or even nine tours between Iraq and Afghanistan; tours that were extended to a year or more in theater, and then often extended for months beyond that. We’ve heard about how soldiers arrive back home after multiple tours and are told that they won’t have to return, only to be sent back again. We know that the suicide rate amongst our soldiers is through the roof. We know that the multiple lengthy deployments is causing an immense amount of stress that eats away at their very humanity, and that they’re not getting the care and treatment that they need–a stark failure of our society and of our government that claims to love and respect and cherish them and their service to their country. In fact, the way they’ve been treated by their own government that sent them to war in the first place is in so many cases utterly disrespectful. Look no further than the appalling conditions that greeted the wounded at Walter Reed Army Medical Center. We know that oftentimes soldiers are encouraged to “soldier on,” given cursory treatment for stress related mental disorders, and with a pat on the back and an “atta boy” (or girl) sent back to fight. We know all this, and we want it to end. The Koran burnings on a U.S. base and the resulting reprisals combined with the murder of 16 Afghan civilians by Staff Sgt. Robert Bales have only intensified the “bring our troops home now” sentiment to a fevered pitch. And rightfully so. These incidents only serve to further illustrate the near impossible task being put on our men and women serving in Afghanistan. And it’s quite likely that the actions of Sgt. Bales has set the effort to “win the hearts and minds” of the Afghan people back years. It’s easy to find hundreds of reasons why the United States should simply pack up and leave Afghanistan for good. Most of the arguments are very reasonable to reasonable people. The trouble is that it’s not that simple. It never was, and it never will be. You see, we’re responsible for Afghanistan, whether we like it or not (and by and large we don’t). As former Secretary of Defense Colin Powell told George W. Bush in regards to Iraq, “You break it, you own it.” The same principle applies to Afghanistan. We broke it. We routed the Taliban government, sent Al Qaeda running for the hills and scurrying to Somalia and Yemen, and began the process of establishing a new civilian government. At that point the focus should have been turned to building the Afghan civilian government up to where it could stand on its own without the aid of the U.S. military. And the mission was well on its way to success by most accounts. The problem is that the Bush Administration got distracted by its maniacal obsession with removing Saddam Hussein from power in Iraq, and the mission in Afghanistan went to hell. Instead of building the Afghan government and training a police force that could keep their own peace in their own country, U.S. forces were diverted to a misguided mission in Iraq. The Taliban was allowed to reconstitute and refortify. The Afghan government that grew from the ashes became as corrupt and inept as any in the world. And by the time the folly in Iraq was completed, it was too late to pick up where the diverted forces left off. What we’re stuck with is a complete mess. We’re stuck with is a feckless Afghan government that is busy playing both sides against itself. The only thing preventing the Taliban from overtaking the Karzai government by force in Afghanistan is the U.S. military because the Karzai government dawdled in its efforts to stand on its own two feet. In the estimation of every reasonable and informed person, official and non-official alike, to merely pull up stakes now would be to reverse every single human dignity gained by the Afghan people and once again plunge them into crushing oppression. This is truly the definition of a no-win situation: We’re damned if we pull up stakes and get out as quickly as possible, and we’re damned if we play out the timeline set forth by Hamid Karzai and President Obama. So let’s remove politics from it, let’s remove war financing from the equation, and let’s focus on what’s really important at this point: We’re responsible for Afghanistan. We broke it, and now we’re struggling to patch together the pieces and glue back it into some semblance of what it was. But we own it nonetheless, and we are responsible, not to the Karzai government, not to the Taliban, but to the Afghan people. We made a promise to the Afghan people when U.S. forces went into Afghanistan in 2002 that we were going to help them build a government that would restore a basic level of human dignity and provide opportunity for future generations to grow and thrive through education and self governance. But because the Bush administration got distracted by the shiny bauble in Iraq, after 10 years the Afghan government still is not ready to stand on its own. And we owe it to the Afghan people to leave them with a measure of security and independence and an ability to fend for themselves. To leave without some sort of settlement between the Taliban and the Karzai government would be as irresponsible as the rationale for the war in Iraq. To leave the Afghan people to their own devices at this stage of the game would confirm every suspicion they have about us and “American Imperialism.” It would also destroy America’s leadership credibility around the world. We all want out. This has got to end and the sooner the better. We all want our troops home, never to have to deploy to Afghanistan again. But we have to do so responsibly and in a manner that does not undermine the gains the Afghan people have made in the last decade. The situation in Afghanistan may be a hot mess, but U.S. forces have nonetheless accomplished something: They’ve given the Afghan people hope for the future. Stick with the time frame. 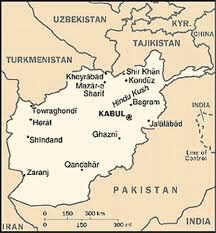 Get the Taliban and the Karzai government talking. Work with them to find a way to work together. Impress upon them that we’re going to leave, but that we want to leave behind a government that can provide a semblance of stability for its people instead of forsaking the last 10 years with nothing but chaos to show for it. The events of the last month—particularly the actions of Sgt. Bales—have surely shortened the timetable for withdrawal. But instead of hastily declaring “victory” (whatever that means nowadays), and tucking tail and running, we owe it to our troops and to the Afghan people to withdraw in an organized and orderly fashion that will allow both the troops and the Afghan people to hold their heads high. This was the first of several posts on Afghanistan by OB Rag writers. Here is the second by Frank Gormlie. IMO we are responsible to all the countrys in the world that over the years have Systematicaly Distroyed for the greater good of the 1% and at the expence of the lower 60% of American people. And now the that it is time for U.S. troops to come home , instead are going to be reposted or redeployed ( most likley Iran, Syria or Africa ) the Mission that was started 10 years ago , NOW needs to be started from the begining. We cant even afford to heal the problems in our own country and the debts for all of this is being extracted from the Working People and those on fixed incomes , To Big To Fail Has Failed ….. There is not a single argument made in Mr. Cohen’s piece that wasn’t being made five years ago. The very fact that these are still the only reasons those in favor of the continuing occupation proves that they are not reasons at all. How long will we “need” to stay there to undo what “we” have done? Apparently, Cohen not only believes that staying in Afghanistan is the right, responsible and moral thing for Washington to do. The way I see it isthis: only imperial hubris would consider the destruction of a country and the slaughter of its citizens to be right, responsible or moral. The phrase from Cohen’s article “we owe it to our troops and to the Afghan people to withdraw in an organized and orderly fashion that will allow both the troops and the Afghan people to hold their heads high” is eerily reminiscent of Richard Nixon’s insistence on peace with honor. Sometimes, the nly thing to do is pick up your equipment and go home-as fast as you can. This is one of those times. Apparently, Cohen not only believes that staying in Afghanistan is the right thing for Washington to do, it is also the responsible and moral thing as well. Are sixteen civilian murders (allegedly) by a single person The Straw to break the camel’s back? Not hardly. And it’s not just the urinating on corpses, or burning of sacred materials, or about a hundred other things, either. But sixteen murders is The One Thing when it happens to be sixteen civilian murders – mostly woman and children – and all (allegedly) by a single American soldier. It is never one thing. But THAT One Thing has now made the outcome certain. We’ve totally lost the objective, that is, if you believe there ever was a solid exit strategy. And now that we know we’d need another ten years to return any of our prior gains, the primary strategic imperative should simply be to cut and run, but while trying not to leave too many weapons of destruction (big or small) behind for the “good guys” to use against us, later. That’s pretty much the problem: There never was any kind of exit strategy at all. EVER. You can thank the Bush administration for that. There was never a set of objectives defined other than get rid of Al Qaeda and rout the Taliban. There was never a plan put into place to deal with the governmental vacuum created when the Taliban was run out of town. And there was never any plan to define what exactly the goals were for the operation and when it would be time to leave. The Obama administration has tried to do much of that since taking office, but it was about 8 years too late. My argument is that yes, it’s time to get out, but we can’t leave until there’ some sort of brokered peace agreement between the Karzai government and the Taliban. The Taliban ain’t going away, so they’re going to have to be a part of the solution, which was deemed unthinkable three years ago. It looks like none of these groups will negotiate with us anymore, as Panetta learned. Now we find out Bales joined the Army to avoid prosecution and/or being held accountable. . . looks like he is a white collar criminal, as per Reuters. The ironies keep coming! Now he will avoid beheading in Afghanistan (heavy sarc). We’re already cutting and running from “The Good War” (remember Obama in 2008?) at the end of 2014 thanks to Obama’s “Smart Power” leadership. All the Taliban has to do is wait it out and they’ll be free to walk back in to continue their faith-based “War on Women”; except it won’t be about free contraception. Talk to the Taliban and make them a part of the solution (which is what they’re now trying to do, but for one reason or another haven’t been able to get the two sides together). The State Department has been trying to get the two sides together in Qatar for the better part of the year. The hope is that if the Taliban becomes a full participant moving forward, it will bring enough stability so that we can GTFO. Yeah and The Paris Peace Accords worked real well for South Vietnam. Again, all the Taliban has to do is wait less then two years when the troops leave, walk right in and take over. Their only incentive for peace talks is the release of their hommies from the still open (Obama broken promise #345) Club Gitmo. Any future negotiations are lost. When they put something on the table and say, “in return, we want Bales to face trial in Afghanistan”. Talks ended. Bales will “never” leave his US-based prison. There is a good argument to be made that the anti-occupation fighters should have been included years ago but the US thought it could win. I think it still believes it can leave gracefully. That time is long gone. As for the question of women’s rights. The best the afghan women had it in that regard was in the 1970s before the US started arming the Islamic reactionaries to fight the socialist like government then in Kabul. The CIA knew who it was funding when it helped create the forces that would spawn Al Queda and the Taliban. The only positive thing left for the US to do is bring its troops, special forces and spies home. Then pay reparations. The only thing left to do is conserve future lives and investments by bringing them all home, safe, now. And make sure we collect all our bullets before the final airplane lands back home because the black market profits off that kinda’ stuff always ends up going to the wrong guys. Cut and Run. . . in orderly fashion (but I mean something different than you might think). Whatever side you’re on it’s over. Get over it. We are done in Afghanistan and can no longer accomplish anything.